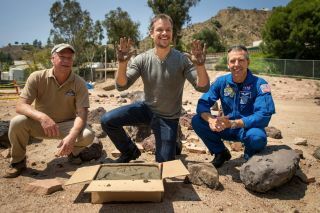 Actor Matt Damon, who stars in the film “The Martian,” smiles after making cement hand prints at the Mars Yard at the agency’s Jet Propulsion Laboratory on Aug. 18, 2015. Looking on are Mars rover Curiosity project manager Jim Erickson (left) and NASA astronaut Drew Feustel. This week, the people behind the upcoming sci-fi blockbuster "The Martian" got a little taste of how real Red Planet exploration works. "The Martian" star Matt Damon, director Ridley Scott and Andy Weir, who wrote the book on which the movie is based, visited NASA's Jet Propulsion Laboratory (JPL) in Pasadena, California, on Tuesday (Aug. 18) — the same day a new trailer for "The Martian" was released. NASA experts served as advisers on the movie, which follows a lone astronaut's struggles to stay alive on the Red Planet. Early in "The Martian," a powerful storm batters the Red Planet outpost where Mark Watney (played by Damon) and his fellow pioneers live. The other crewmembers evacuate and head back to Earth, but Watney doesn't make it onboard the escape ship and is presumed dead. Watney must find a way to survive by himself on Mars, and alert mission controllers on Earth so they can mount a rescue mission. Damon said he's a fan of space exploration and the quest to settle other worlds such as Mars. Humanity's survival "is dependent upon getting off of this planet and going out," Damon said in a NASA video released Wednesday (Aug. 19). "Hopefully, the message in a movie like this is one that really kind of galvanizes participation in stuff like this and makes people excited about science." From left to right: NASA astronaut Drew Feustel, actor Matt Damon, director Ridley Scott, author Andy Weir and NASA planetary science chief Jim Green participate in a Q&A session about NASA’s journey to Mars and the film “The Martian” on Aug. 18, 2015. The actor also voiced admiration for the NASA scientists, engineers and astronauts who are working to put boots on the Red Planet. "Thank you for what you've done, and for what you're doing," Damon said. "Those of us who aren't brave or smart enough to be doing this kind of work are extremely grateful for the work that they're doing, and we know how important it is." JPL is NASA's go-to center for the robotic exploration of worlds beyond Earth, and it's heavily involved in up-close Mars observation. The facility serves as mission control for NASA's Curiosity and Opportunity rovers, the Mars Reconnaissance Orbiter and the Mars Odyssey probe, for example, as well as the Mars InSight lander, which is scheduled to launch in February 2016.